Pianists like Bill Evans and Herbie Hancock create amazing sounds by using clusters in their comping, arrangements and improvised passages. For most guitarists, these sounds may seem out of reach (literally!) because of the challenging stretches that it requires in the fretting hand. For some, the sounds may be just too difficult to figure out by ear. Are the sounds really too difficult? Maybe you just didn’t have an experienced guide to help you! Develop your modern pianistic jazz guitar sound today and level up your voicing vocabulary!. This is your first step to sounding like John Stowell, Bill Frisell, Jim Hall and Bill Carrothers. This will be a master class video that you really maximize even in the first viewing. With repeated study, you can even more ideas via the performance examples too! This 2015 master class has now been enhanced with segmented video chapters to help you quickly go to your favorite sections over and over. In addition to the segmented videos, the newly Soundsliced enhanced notated examples provides BONUS examples that go beyond the material already covered in the video, including harmonic minor and melodic minor cluster voicings. 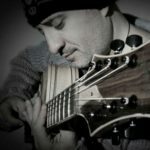 For more advanced guitarists, Juampy has also included some challenging clusters for you to try. Get these beautiful clusters in your playing now for your contemporary harmonic palette! 6 Pages of PDF materials in standard notation and tablature. Full video is 1 hour and 1 mins. Excellent class! This is a nice continuation of Juampy’s previous class on Modern Comping and clusters. The material is well laid out, well explained, and there are enough written examples to get you to understand the concepts.